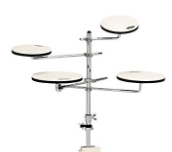 Thinking about buying a kids electronic drum set? Musicality is a fantastic gift to give to a child. 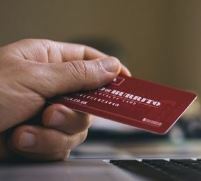 However, it is easy to get confused by the number of options available when deciding what to buy. Perhaps you want a simple percussion pad for a young child or a kids electronic drum kit that will get the little one off to an early start in rhythm and percussion. I’ve listed out the top choices for each different purpose. I have also included loads of tips in this article to help you encourage your kid to play drums. Here is a selection of both the starter drums and toy drums that we are going to be discussing in this article. I’ve actually also included one kid’s acoustic drum kit in this article, as this could also be something to consider. 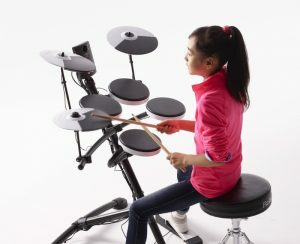 Starter electronic drums: this is for the young budding musician. Toy electronic drums: these are great as gifts for younger children. 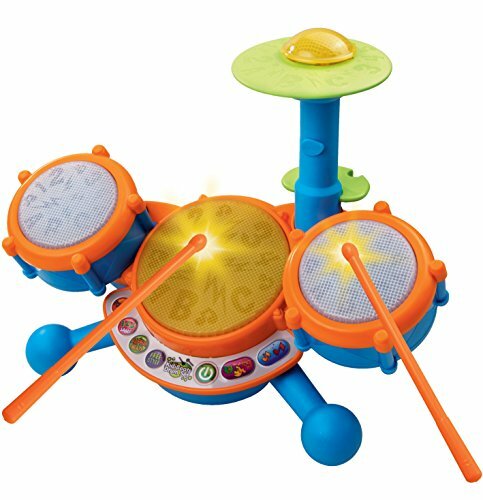 For Toddlers - Toy electronic drums from VTech. Great for younger kids. Very Compact - Fun and convienent. Comes with a built-in speaker. 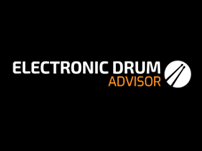 You might be surprised to see larger electronic drum sets on this list. Both of my nieces (aged 6 and 10) share an Alesis Nitro kit, and they both have an absolutely fabulous time playing on them. There are plenty of videos online of children playing behind a full drum set. I only wish I started playing behind a full kit that early! The two main drum sets I’d consider for kids are the Alesis Nitro Kit and the Roland TD1KV Compact Kit. Both of these are relatively inexpensive, and they would be very useful for many years to come. You should seriously consider investing in a full kit if the lucky little recipient of your electronic drums is over 7 years old (or tall for their age). These should be particularly at the top of your list if your child is approaching 5 feet tall. For example, check out this video below of a kid playing a full sized Alesis electronic drum set. The Alesis Nitro Mesh Kit that I recommend in this article is actually much better than the electronic drum set in the video, because it features mesh heads and a much better drum module. 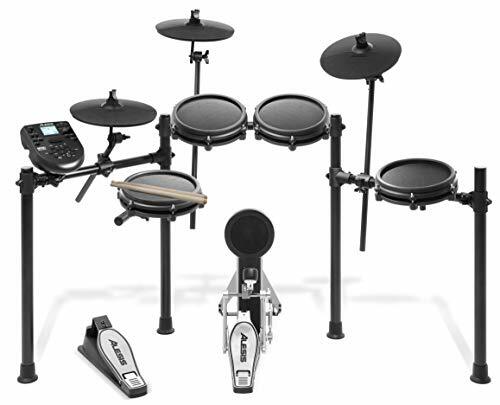 Take the Alesis Nitro Mesh Kit for example, this is an extremely popular model among adults and is a great trade-off between price and features. It includes all pads and pedals required. As someone who has played behind an acoustic drum kit for over 13 years, I was pleasantly surprised at the quality of this kit. Check out our more detailed guide on the Alesis Nitro Mesh Kit. Another great model is the Roland TD1KV. Roland is a powerhouse for electronic drumming. I’ve used them for years and they are top quality. This is a nice compact kit and has some great response. Try to get model with a mesh snare head (The TD-1KV as opposed to the TD-1K), these are absolutely fantastic. They very nicely replicate the feel of a real acoustic drum. 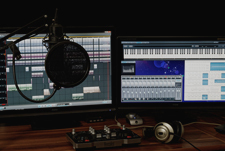 For this reason, this could be a great option if you’re planning for the electronic drum kit to be an precursor to into a full acoustic drum set in future. Check out our more detailed review on the Roland TD-1KV. Perhaps you’d like to jump straight into your kid using an acoustic drum set. 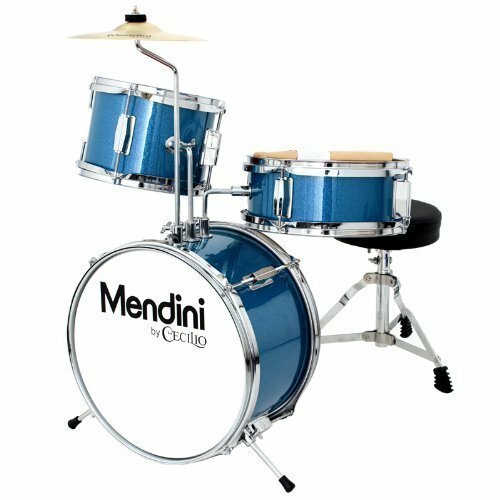 A very popular kids model is the Mendini 13 inch kids drum set. Please note that this is only designed for kids smaller than 5 feet tall. Otherwise, there could be a lot of uncomfortable slouching! It’s an extremely affordable choice for a kids drum set. It could be used as your practice run before investing in a more expensive set. This particular pack includes everything you need to get started. It includes a drum stool, drum sticks, and a bass drum pedal. However, as this is not a full drum set (no hi-hat pedal and only one tom are included) it will offer the same amount of practice possibilities that are more fully fledged kit will offer. Now let’s move onto the fun little toy options. These are great as little gifts, or for very young children. You can also use electronic drum pads and sets as nice toys without hassling the neighbors! When talking about kid’s toys, it’s very difficult to not mention VTech. They have an extremely popular kid’s mini drum-set. It’s also extremely cheap. If you have a toddler that’s constantly drumming on household items, this could be your best option. It comes ready to go right out of the box. There are some features and loops, but these can be turned off to allow for true freestyle playing! Have you ever heard or a roll-up drum set? These are very handy little gadgets that can be rolled up and stored away when not in use. Take the Paxcess roll up drum set for example. This is a great option, which includes an inbuilt speaker. 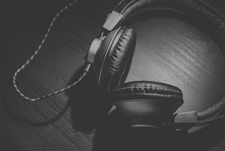 Headphones can also be plugged in, which enable quieter playing and practice. 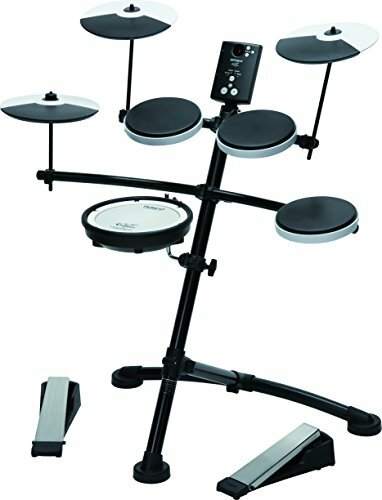 The ‘best choice products’ electronic drum set is a lovely choice for young kids aged 3 and up. It could also be suitable for slightly younger kids. This set is battery powered and contains a volume adjustable speaker. The kit has a lovely, colorful design and contains light-up buttons. It also contains something that you won’t see in any other drum sets mentioned in this article: A sing-along microphone! Train both the rhythm and vocal ambitions of your young budding musician. The adjustable sing-along kid’s drum set. 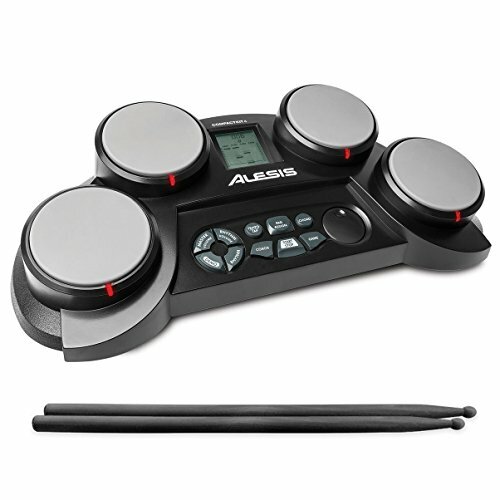 Alesis have become a major player in the electronic drum kit market. 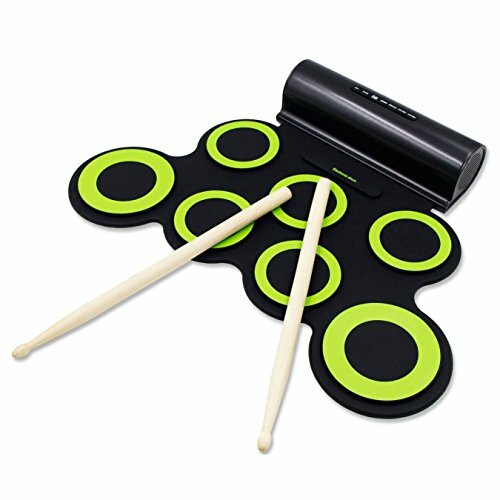 They have released portable tabletop electronic drum pads. Although these are not exclusively for children, they are also sized very nicely for that purpose. This is battery powered and the model contains inbuilt speaker. You can also plug in headphones and hook it up to an external speaker. The drum coach feature on this could also be a great option for teenage drummers that are practicing their rhythm. Playing any musical instrument is beneficial for children, for many different reasons. From easier socialization and emotional development to developing motor skills and cognitive elements, you’ll enrich your child’s life if they start playing the drums. Still, learning to play an instrument is a long and winding road, upon which you might come across some barriers. 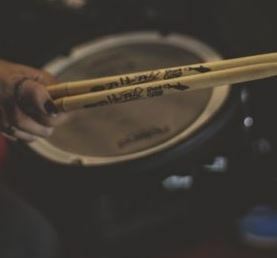 This text is meant for parents, as well as for rookie drum instructors, to show them what tips and advice they can use to encourage children to play drums. One of the most common mistakes parents make is forcing their children to do something to meet their parents’ desires. If you try to apply this tactic to drumming, your child could easily lose motivation and abandon this instrument. Drumming requires a specific set of teaching skills. For starters, a child could start their drumming practice with simple rhythms, without drums. You can use rattles, tambourines, or the maraca and choose a song along which you’ll be playing these instruments. The rattles don’t have to be the commercial ones. You can simply fill a plastic bottle with rice or small stones. Children usually like to play with toy drum sets, where you get a plastic snare and two sticks. Although this might be a bit intensive for your ears, it’s a great way to let your children play, as well as to see if they have talent for drumming in the first place. The end goal here is to teach your children to follow the rhythm with a certain rhythmic instrument, but through amusing activities. What’s also important is to play the songs your children like, and not the ones that you like. That’s the best way not only for them to try and play different rhythms, but to inspire them to fall in love with drumming, as well. Also, at this stage you can show them the difference between beat and rhythm, as shown in this great tutorial. You’re going to different opinions on the right age to start playing drums. Most children at the age of seven should be able to take up drumming as their hobby. This doesn’t mean that you can’t start working with your child at a younger age. The aforementioned games and simple drumming exercises are a good start. 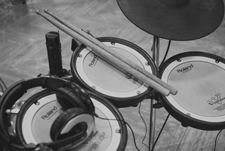 If you discover that your child is both talented for drumming and enjoys this activity, you can offer them to start playing a real drum kit, but adapted to the young age. 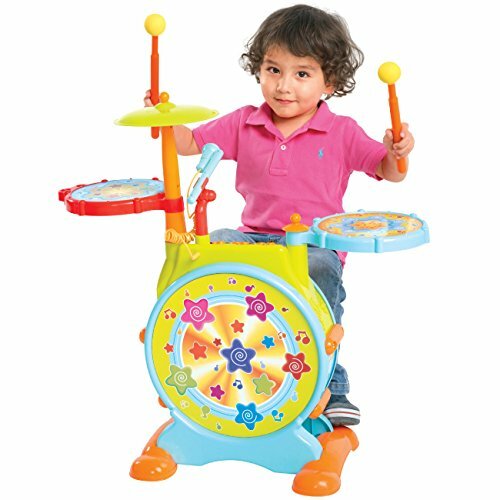 For instance, you can opt for one of the ready-made toy drum sets. They come with all sorts of drumming elements, where children can not only express their creativity, but also show their ability to play drums. One of the most efficient ways for kids to learn the components of a drum kit is to let them use the one with colored elements. Children often learn in an associative way, which is a more efficient tactic to memorize things. That’s why learning to play drums with the use of such a drum set will help them memorize the elements faster. Further, if your kid has already reached the age of 7, or is extremely interested in drumming, you can go for a full-scale, five-piece junior set. It will include the snare, the bass drum, the tom toms, the hi-hat cymbal and the crash cymbal. Sometimes a third tom-tom drum is added to the regular two pieces. Whatever a parent or a drum instructor does, it’s important to keep children amused and entertained while they’re learning to play drums. Sometimes parents get carried away by the progress their child makes at the beginning and start dreaming about a drumming career for their beloved descendant. While being ambitious isn’t bad, don’t ever transfer your own dreams onto your child. So, the most important method for steady progress with young drumming learners is to let them play as they’re learning. What’s also important is to make children feel subjects in the entire learning process, rather than objects. In line with that, you can suggest them to choose the color they find suitable for every element of the drum set. The drum sets for toddlers usually come in color, but you can let your older toddler or a preschooler associate each element with a different color. Rather than coloring the elements, you can help them color a few pieces of paper and stick them onto the elements. When it comes to drum instructors, they can also use colors to highlight notes for drum-learning children. For instance, if the snare drum is colored green, you should draw a small green circle above the snare note and follow suit for every single element in the score. The same pattern can be followed when you’re highlighting the hand patterns for young learners. You can learn more about these color schemes in the guide on the Drummer cafe website. You can sometimes hear parents saying that their children are quitters. This is even more common when it comes to playing a musical instrument. The truth is that parents are simply washing their hands of their own responsibility for their children’s progress. While we’ve said that forcing your kids to play drums if they don’t want to do it is wrong, it’s also bad to ignore their progress. No matter how good they are at drumming, it’s important to encourage them daily. If you motivate them to play their drums every day and praise their skills, they’ll be more than happy to repeat the same action the next day, on and on. You can also inspire them to practice drumming by setting your own example. For instance, you can ask them to show you what they’ve learned today, and join them in their drumming session. No matter if you’re just hitting the tambourine or rattle along a song, your child will be delighted that they’re playing music with their parents. Further, don’t ever miss a public performance your child has. 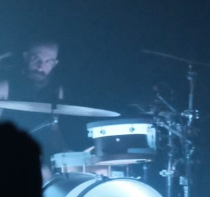 When they sit on their drum throne, it’s you that they’ll be looking for in the audience. If possible, bring along as many relatives and friends as possible, to show your full support to your child’s effort. Teaching your child to play drums is a process that requires constant commitment from both sides. As a parent, you’re the cheerleader of the entire effort, but it’s the child that’s the star of the show. You should provide them with proper drum sets and other accessories, appropriate for their age. Also, you should find an experienced drum instructor who has the knowledge to work with children. What’s also important to do is encourage and support your child throughout this process. Even when they don’t feel they can move on, you need to motivate them and show them how much they’ve already achieved, especially by setting your own example to them. All these things will help you and your child get into the exciting world of drumming. It’s truly never too early to pick up drums. Rhythm is a skill that can be constantly improved on, and an early start can make all the difference. If your child is approaching 5 feet tall, I would definitely recommend investing in an adult electronic drum set.